Dr. Tai Frederico conducted preliminary exams on Watson and 27 other dogs rescued from a Rhea County puppy mill now housed at HES in Chattanooga. Five days after Watson and 108 other dogs were rescued from a dark, filthy puppy mill in Rhea County, the frightened 12-pound Yorkie mix doesn’t look like the same animal. 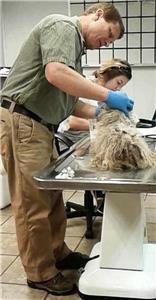 Watson got lucky; he was one of the 28 puppy mill survivors that wound up at Chattanooga’s Humane Educational Society. There, volunteer groomers from Pet Smart shaved away the heavy, massive tangle of dirty, matted fur which had weighed on Watson and kept him trapped inside for years. Dr. Tai Frederico, the local veterinarian who doubles as president of the HES board of directors, spent long hours Wednesday doing preliminary exams on Watson and his 27 fellow survivors, checking for dental disease, tumors, infections, broken limbs and other medical problems. Physically, the dogs are safe, housed in clean HES cages with plenty of food, water and room to stand up and turn around. They’ve been wormed and treated for the massive flea infestations from which they suffered. Emotionally, however, they’re train wrecks. Many, unused to any human contact, shiver constantly and uncontrollably, according to volunteer coordinator Ashleigh Horner. Some lie facing the rear of their cages, afraid to even look at the people now caring for them. Now – with the initial stages of the Rhea County rescue taken care of – it’s HES that needs help, Mrs. Horner said. Early in September, HES was inundated with dogs rescued from the path of Hurricane Florence, she recalled. That influx came on top of the record numbers of puppies and kittens that wound up on HES’s doorstep this year, she said, noting more continue to arrive even though summer has come and gone. New mothers and their puppies or kittens don’t do well in an animal shelter situation, Mrs. Horner said, so HES always tries to find foster homes for them. For people who want to help, she said, HES needs financial donations even more than it needs foster families. The Rhea County operation, which will cost HES about $30,000 for veterinary care alone, came just weeks after the dogs rescued from Hurricane Florence, she noted. Some of those dogs have been adopted, Mrs. Horner said, and others taken in by rescue groups from northern states which will care for them until the animals find permanent homes. But two dozen Hurricane Florence dogs remain at HES, and several of those dogs also have medical problems requiring expensive treatment, she said. Things were just getting back to normal at HES after the hurricane, according to Mrs. Horner, when they received the call last Tuesday from the national humane society asking them to help with Rhea County’s puppy mill dogs. “When something like that happens, you just go,” she said. Less than an hour after HSUS called, HES workers were on their way to Rhea County Animal Shelter. They arrived to find that RCAS already had doled out a large number of the animals to individuals, she said, and a long line of people was still waiting outside the shelter to claim one or more dogs. Eventually, HES wound up with 28 dogs – many of them an estimated eight or nine years old and suffering from medical conditions requiring immediate care – which were immediately brought to Chattanooga. That same evening, Mrs. Horner said, the humane society in Nashville picked up another 20 puppy mill dogs to take to their shelter. Preliminary exams revealed that the vast majority of the 28 dogs at HES suffer from dire conditions, she said; for example, almost all most have mouthfuls of teeth so rotted they will have to be pulled. “That’s pretty common when dogs are fed cheap food and given no veterinary care,” she noted. Further, physical exams revealed that one male dog with a tumor may have testicular cancer, Ms. Horner said, and several females have mammary tumors – it’s unclear at this point whether they are malignant – that will require further medical care. To donate to HES, go to https://www.heschatt.org/give/.